The Head and the Heart of our family, my Mother and Father, were truly remarkable people, who were born before their time. They were enlightened and progressive, but their greatest influence on their childrens lives was the love in which they enveloped them and the good example of their own lives which they gave them. 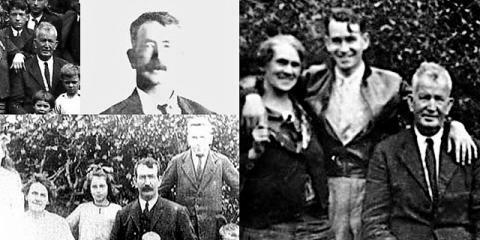 The Head of the family: My Father, Daniel Stephen Crowley, was born on 28th December 1872 in the suburbs of Cork. His father James, was born in Dunmanway. He was a Fenian and had to leave Ireland after the rising to escape imprisonment or worse. His mother, Mary Crowley was a relative of the East Cork patriot, Peter O’ Neill Crowley, of Ballymcoda. James returned to Ireland after an absence of five years. He died at the age of Sixty-five. His land was divided among his five sons. His wife lived to be Eighty-four years old and until the day she died she kept control over her family. In appearance, Father was tall and well built. He was a strong healthy man whose life was spent in the open air. He cultivated the land he inherited with intelligence, independence and pride and became a successful Market Gardener. He built a solid two-story house on his own land. In that house, a very happy family of six boys and four girls were reared. He was very loving, but a firm father, wise and just. He gave the best within his power to give, to his family. This attitude of his was symbolized by his custom of bringing “the first fruits of the earth” to Mother. These fruits were not for sale. He was an intelligent man and ambitious for his family. He believed in the value of education for all, four University Graduates (May, Billy, Peader and Kevin?) and the winner of a Medal for obtaining First place in advanced Arithmetic in Ireland and Britain (Jerry). He was ahead of his time in this and many other ideas. His advocacy of a United States of Europe pre dated the present day concept of the European Community by about fifty years. His concept was a Europe united for the prevention of recurring wars. Predictably, in the light of his parentage, he was intensely patriotic. His love of Ireland pervaded his whole life. The principle by which he lived was that everything Irish was best. Goods manufactured in Ireland were not only the goods bought by him, they were the best that could be bought. In the Home Rule movement, he was a supporter of William O’Brian. During the war of Independence he transported guns and ammunition through a City swarming with Black and Tans. He was a Sinn Fein Magistrate during the years 1919-1922. On the signing of the treaty, he took the Republican side. He died on 24th January 1940 at the age of 68.